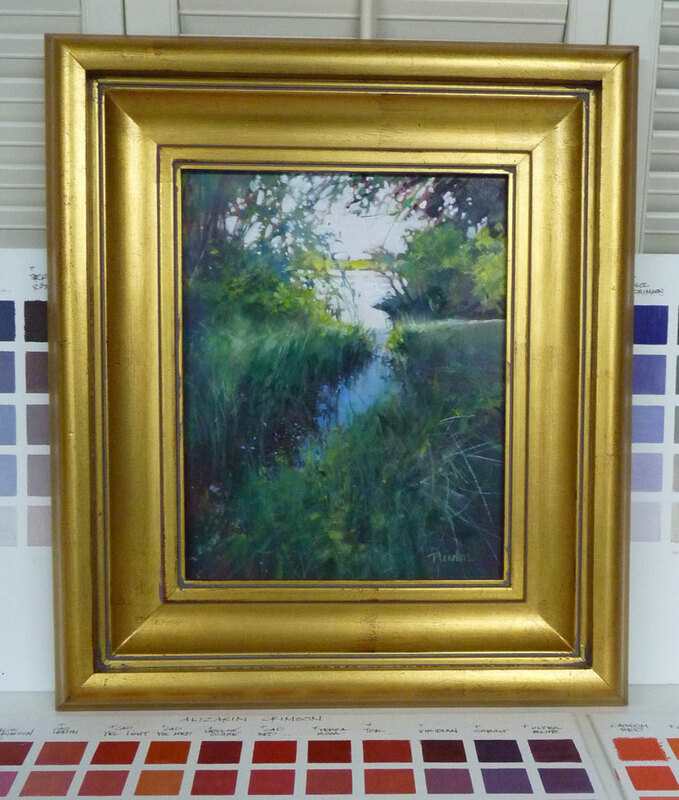 Another 10 x 8 inch oil color study. 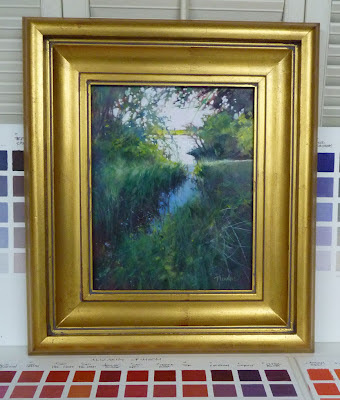 I finished this one before I found my Richard Schmid color charts which would have been really helpful with all the greens I had to mix. This is another scene from Golden Gardens park in Seattle. I returned there several weeks ago and took new reference photos which are very different from the winter photos I had been working from. Trees have leaves, grass is tall and everything is GREEN. Below are a couple paintings from the winter photos. This post is especially for my friend Kay who is falling in love with oil. 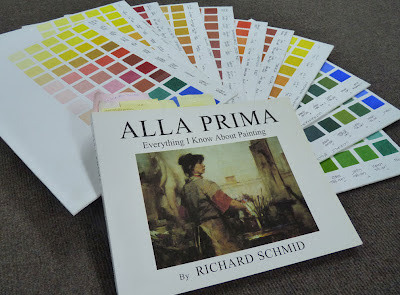 Six years ago I purchased Richard Schmid's book, Alla Prima. Pages 132 and 133 show color charts. He describes making the charts as 'an astonishing experience' and I agree. I loved making them and am glad I found them again recently during my big studio cleanup. 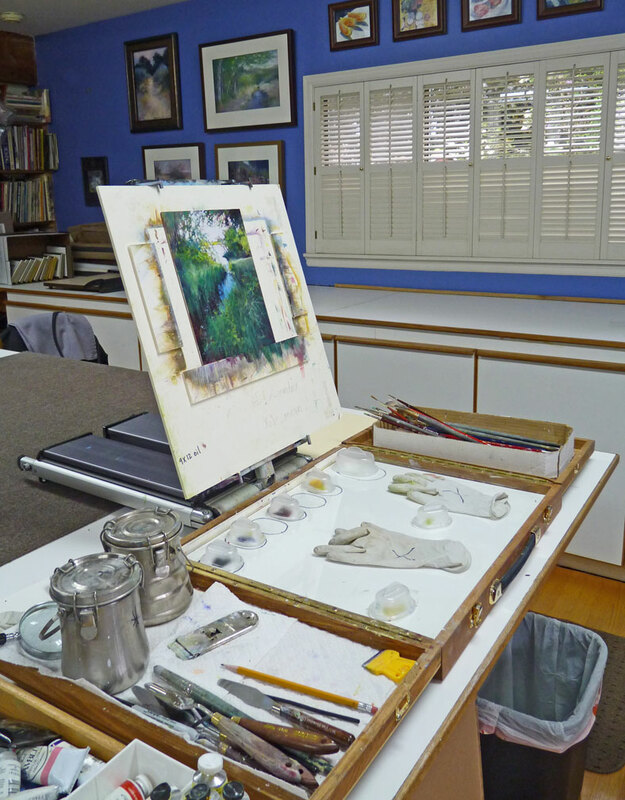 Now will be a good time to reread the book and put what I learned then into practice on this summer's little oil color studies. The real purpose of this blog post is to celebrate the clean counter-top in the background. That is where my pastel painting alleyway used to be (shown the the small photo below). When I begin working in pastel again, I'll have big changes and improvements to a new working area. I'm painting in oil for the summer with my oil painting station set up at the end of my big worktable. 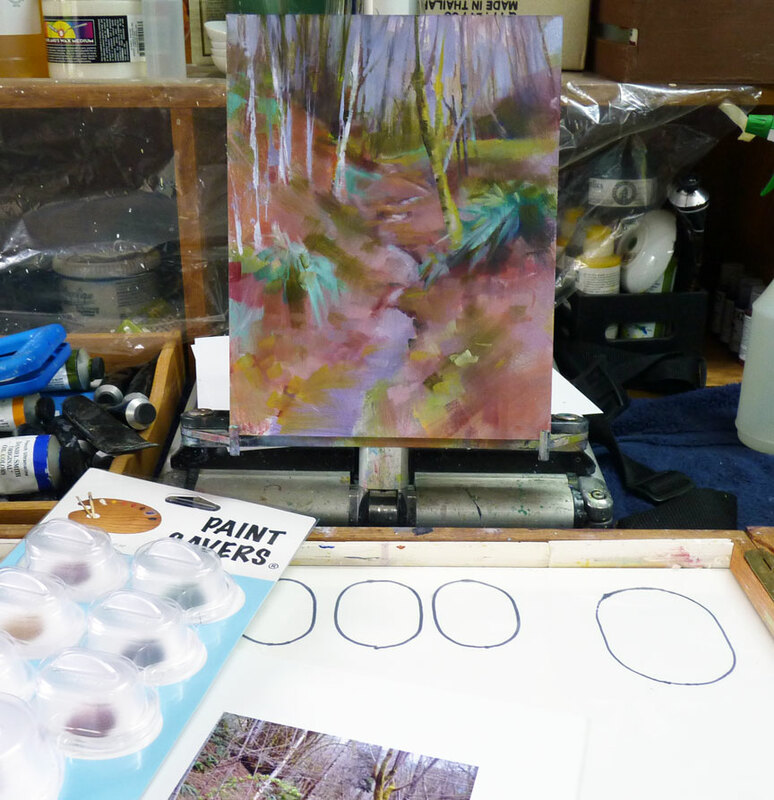 My good, old Soltek easel works well for table top work. I love my Soltek except for the problem that sand can get into the telescoping legs. My little Paint Saver covers are in use and working well. Wishing everyone a happy Memorial Day. 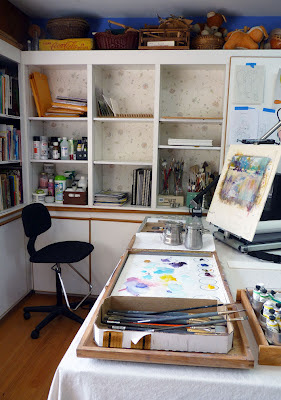 Rainy days so no need to water the garden; more time for painting and rearranging the studio. 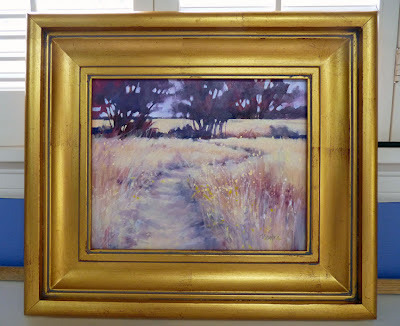 I think I'm done with this oil color study of the subtly hued grasses of Oregon in August (it was hot!). 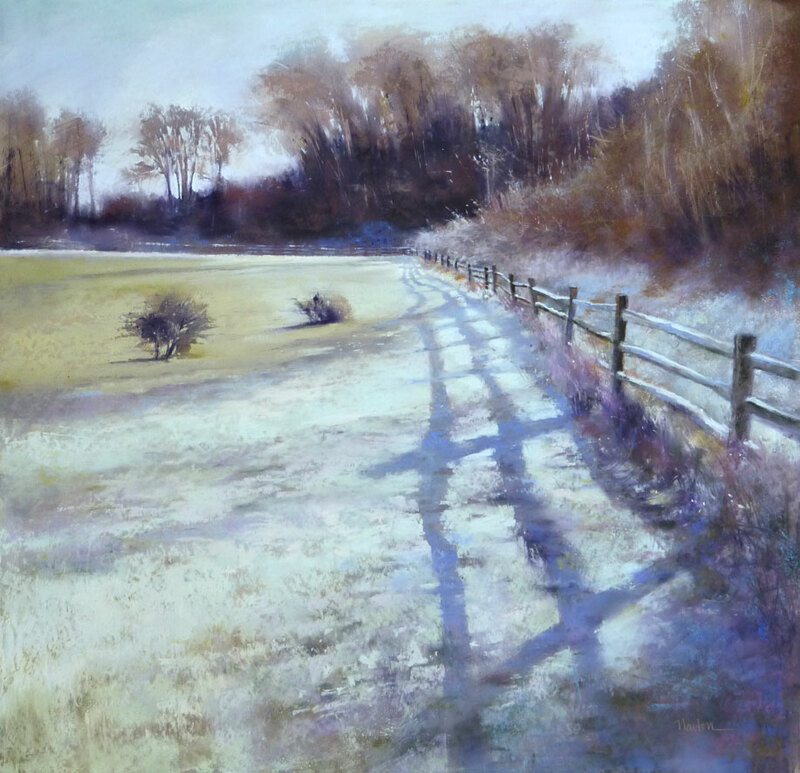 Looks like a good candidate for a larger work in pastel next winter in the studio. 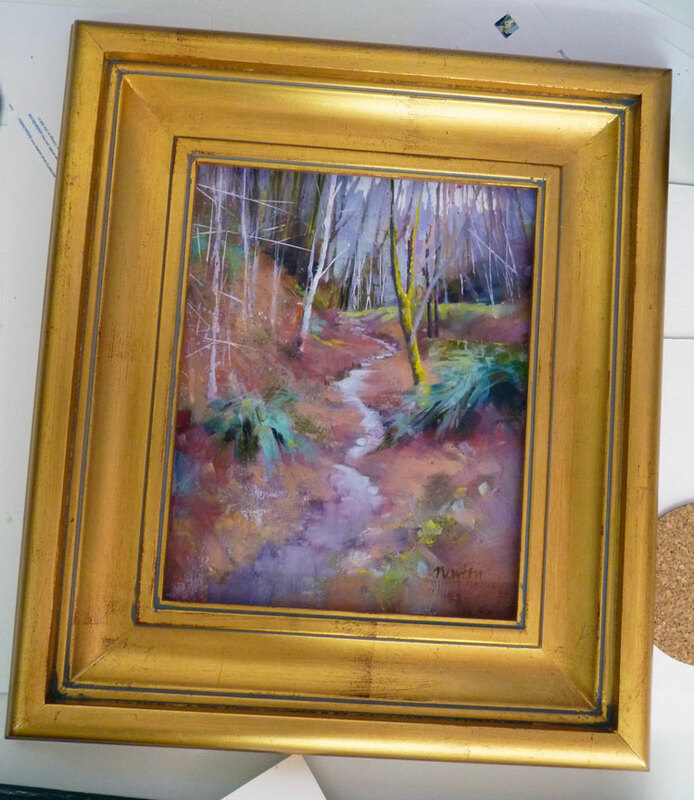 This little study is 8 x 10 and will go to the Daily Paintworks Auction when it is dry. I found a jar of rosy hued gesso in my studio; primed an 8 x 10 panel and began a little oil using a limited palette. At about 90% complete, I photographed the work, opened the image in PhotoShop and adjusted areas using the clone stamp tool and printed the image. 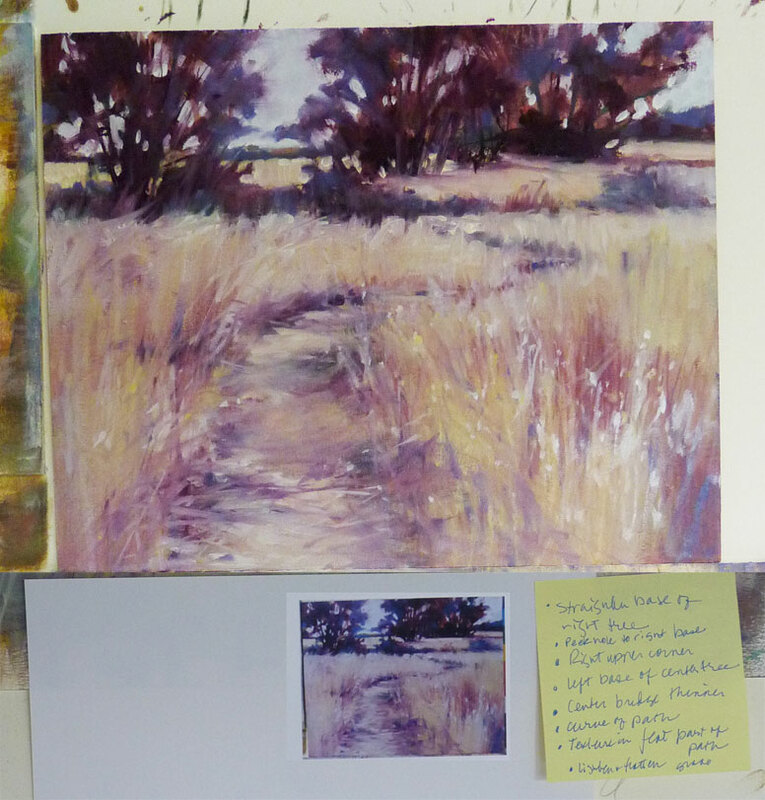 Now, I'll go back to the easel and make the adjustments per my notes as well as the little visual reference. For the past two days, I've been cleaning my studio - throwing old stuff out and rearranging what is left. It made me sort of crazy to use my daily painting time to clean, but now my oil painting corner actually has empty shelves (for the moment) and I had the chance to paint again today so now I feel more "normal." 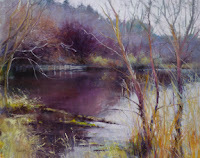 My husband took the reference photo for Color Study in Oil #2. 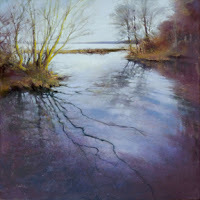 Completed this morning, it is 10 x 7-7/8 inches, oil on panel. This one makes me want to get my pastels out right now and start on a larger painting of this scene but I am committed to working in oil for a few months and to even paint plein air! 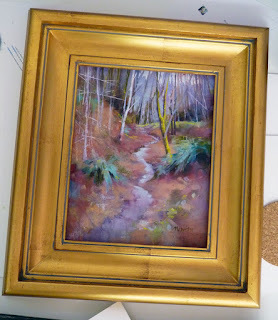 I'll post this painting on my Daily Paintworks Gallery and it will go to the auction, unframed, probably Saturday starting at $30. I usually paint in pastel with an oil-wash underpainting but I have put my pastels away and am having a great time (and much anguish) painting in oil for the summer months. 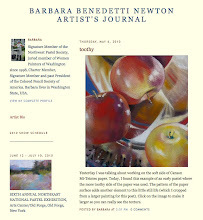 I recently purchased Paint Savers on the recommendation of Carol Marine in her April 28 blog post. I inserted a piece of white matboard under my glass palette. 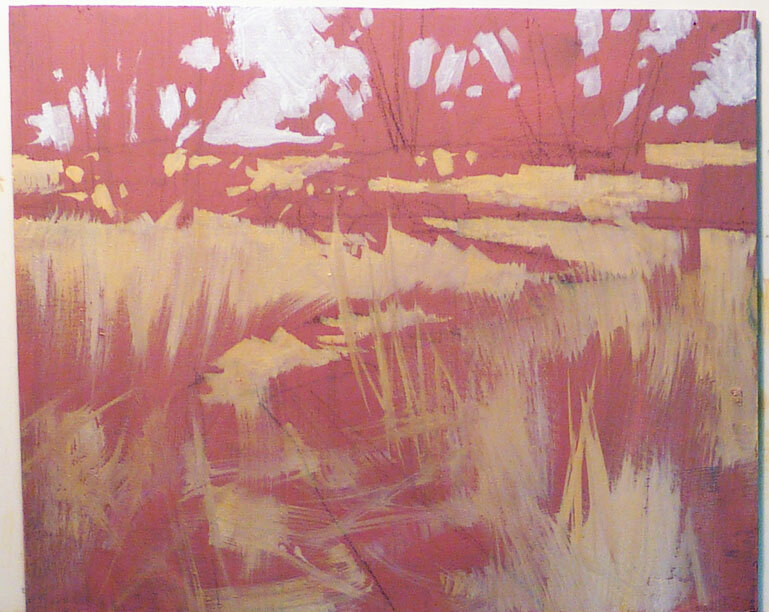 While I was marking the matboard for the Paint Saver placement, I set them aside, on top of my glossy reference photo. Mistake! I did manage to separate them from the photo paper but it wasn't easy. Do not set Paint Savers on glossy photo paper! I look forward to loving this product. Will keep you posted. And, GREAT NEWS! I received Best of Show at the Northwest Pastel Society 26th International Open Exhibition at The American Art Company, Tacoma, WA for "Heartbreak Morning." Juror was Elizabeth Mowry. I am especially honored because the entire show is very strong; see it if you can! A great reception tonight at Scott Milo Gallery for the Women Painters of Washington show and I was happy to see that it really is FIRST PLACE! 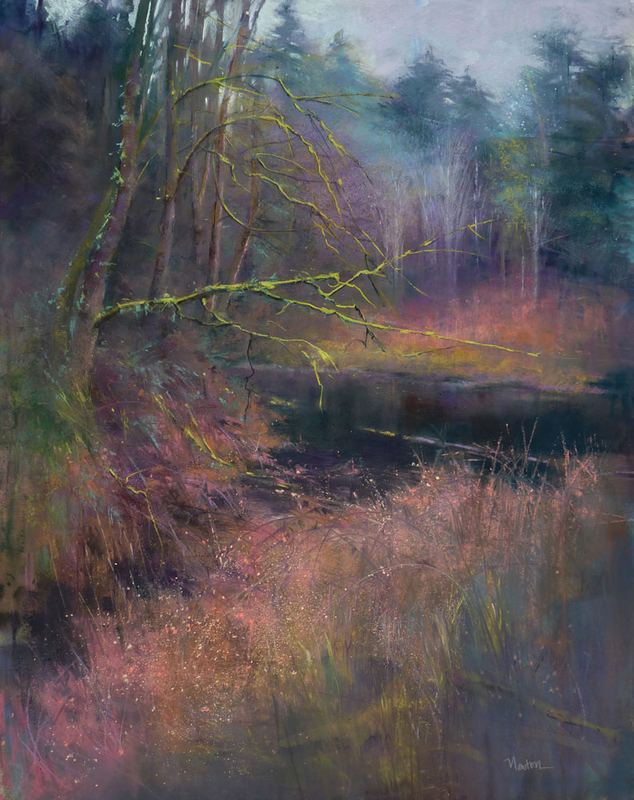 I just received word that my pastel painting, "Sanctuary," received the First Place Award at the Women Painters of Washington Annual Members' Show at Scott Milo Gallery, Anacortes, WA. The judge was Jennifer Bowman. Yay! Whoops! 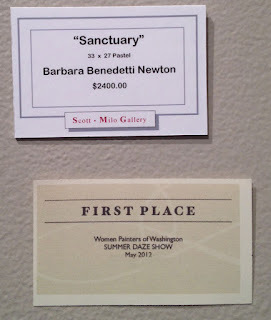 Just found out WPW have combined Best of Show/First Place so this is actually Second Place but I am happy! Later...a communication problem. It really is First Place!